This next two exercises require a little prep-work. Make sure that you can see both the preimage and image by using the move and the zoom tools. You can also choose the select tool and click and drag to move and either roll the mouse wheel or pinch to zoom. Once you can see everything, you'll need to select the line segment tool . You may need to long press the line tool to find it. Your goal is to connect each of the points on the preimage (brown) to their corresponding point on the image (pink). After selecting the line segment tool, first click on point A, then click on point A'. Line segment AA' forms. Create segments BB' and CC' as well. If you make any mistakes, you may click the undo button in the top right or you may use the select tool to select, right click (long press and select delete on mobile devices) and delete the mistake. If you really messed things up, you can always click the reset button on the top right of the page. 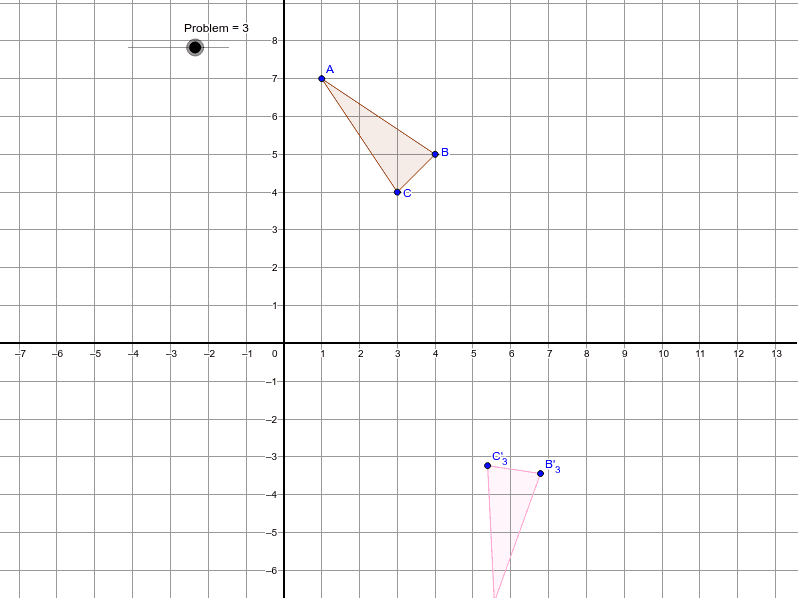 Now you need to find the midpoint of each line segment. Fortunately, you can use the midpoint tool to do this. You may need to long click on the point tool to find the midpoint tool. Once the midpoint tool is selected, click on a line segment to place a point at the midpoint. Considering any one of the line segments you just created, what is the distance between the midpoint and the point on the image? What is the distance between the midpoint and the point on the preimage? You can use the distance tool (you may need to long click on the angle tool to find it) by clicking the two points you'd like the distance between. Do not check your answers until you have finished all of the questions on this page. Find the equation of the line of reflection. Here's a really big hint: make a line connecting the three midpoints you just created and consider if that line might be a possibility for the line of reflection. Give a fraction answer for your slope and y-intercept, not a decimal approximation. Move on the Exploring Reflections 5.